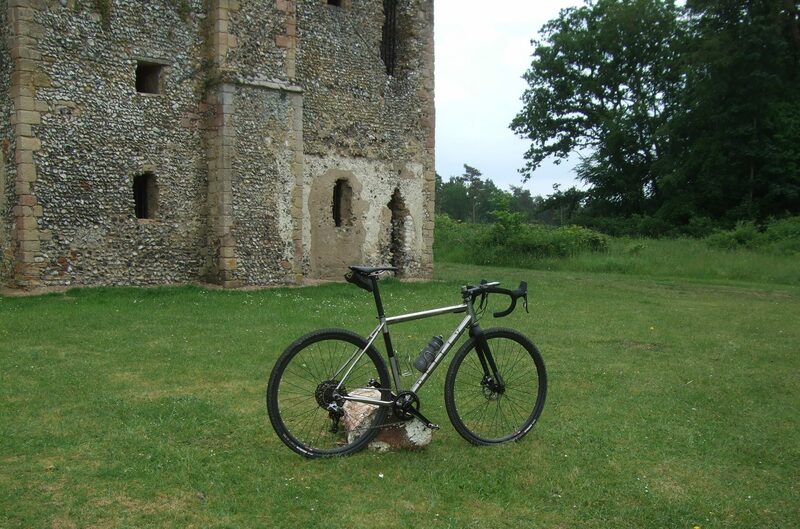 Based purely on the evidence of bikes we have had in to test, Brighton based brands seem to have an unfair advantage. There must be something special in the water or the beer. Or could it just be having the South Downs on the doorstep? Whatever it is, every test bike, boasting a Brighton heritage has stood out, head and shoulders, above the crowd. The most recent visitor to ADVNTR Towers, the Reilly Gradient, just raised the bar again! The Gradient is a thoroughly modern ‘go anywhere’ bike. Equally at home on or off road, it will take you anywhere. And it will do it fast! Progressive geometry means the Gradient is capable running both 700c and 650b wheels. Unfortunately we never had the time to try it out on the smaller wheel size. The frame is assembled from (raw) profiled 3Al/2.5V titanium tubing. The down tube boasts flattened and tapered sections while the top tube is subtly shaped. You really need to see it in the flesh to fully appreciate it. To the cognoscenti it is almost art on wheels. Our test bike was built up with 1×11, SRAM Rival and retails for £2,899. 700c Fulcrum Race wheels and a smattering of own-brand finishing kit complete the assemblage. The wheels were not setup tubeless when the bike was delivered and not wanting to mess around, we quickly swapped the wheels out for one of our own wheelsets. The Fulcrum wheels are fine, nothing special but nothing to moan about either. Lighter and stiffer wheels would be our first upgrade choice if entering Reilly ownership. 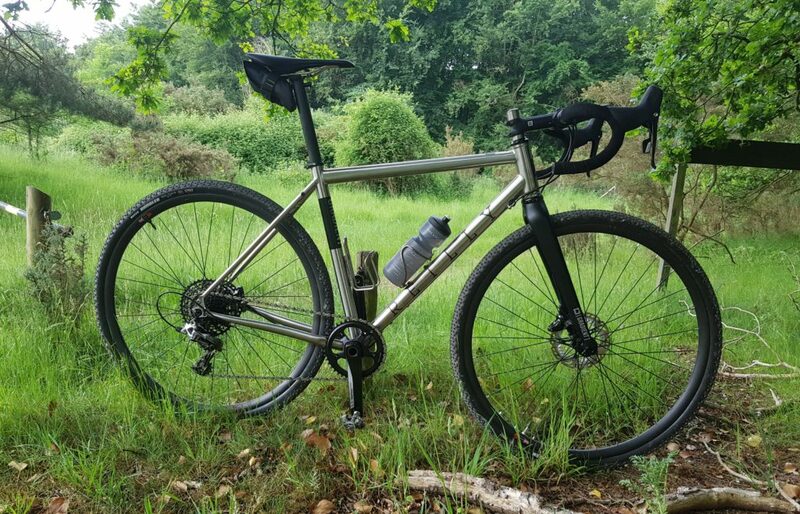 If you prefer to build the Gradient up yourself as your dream bike, the frame retails at £1,499 or £1,799 with a full carbon, 15mm thru-axle Selcof fork. This horse doesn’t trot. It gallops. 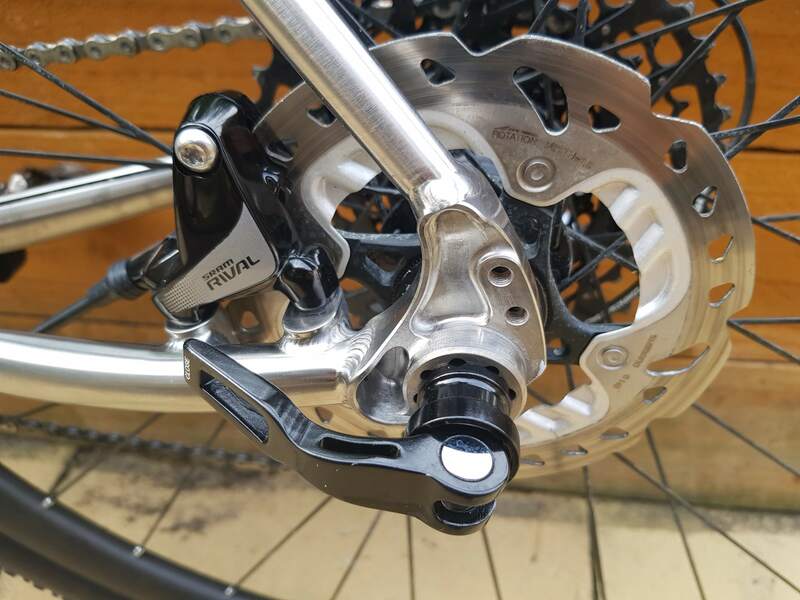 The rear axle is a bolt thru X12 and brake mounts are flat mount. I found the alloy Fizik branded compact bars a little too road biased when riding offroad. I would have preferred something with more flare for that extra control on singletrack. 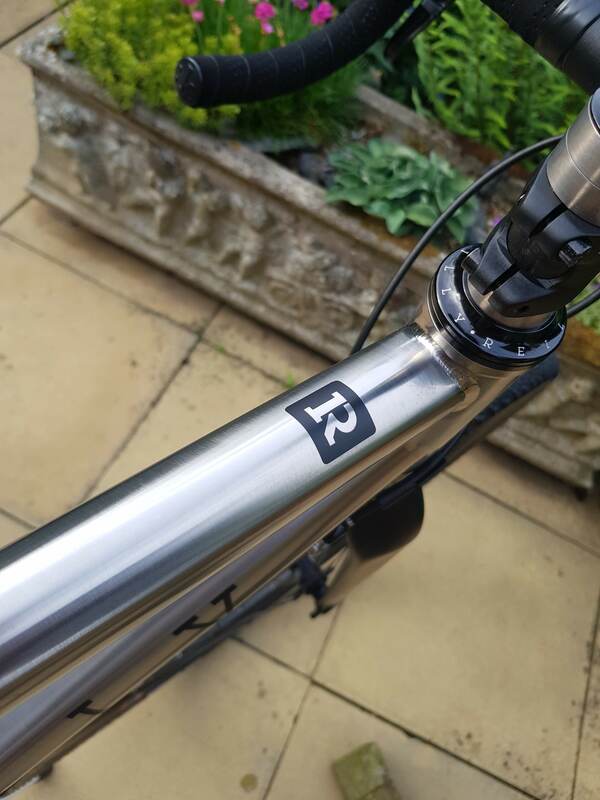 The Reilly branded carbon 31.6mm seatpost and the Ti railed saddle complemented the overall build. 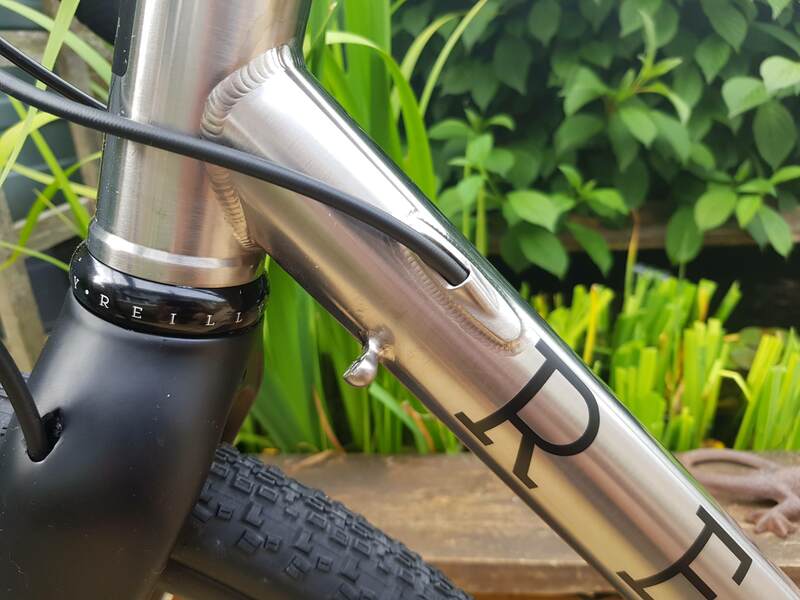 Reilly keep things nice and simple with a threaded bottom bracket and other than the rear brake hose, all the cables are externally routed. These choices all meet with our wholehearted approval. Taking a breather with some history. 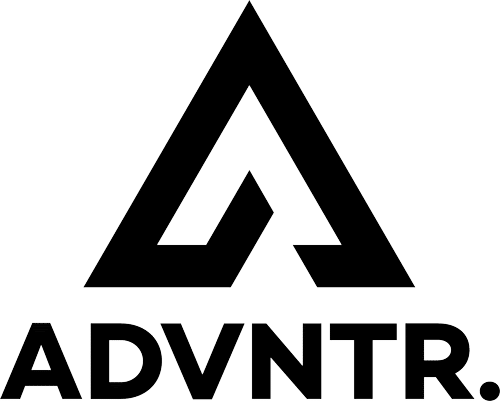 How does the Gradient stack up as a ‘go anywhere, do anything bike? In the interests of science, I took it everywhere and did everything you could normally be expected to do on it. 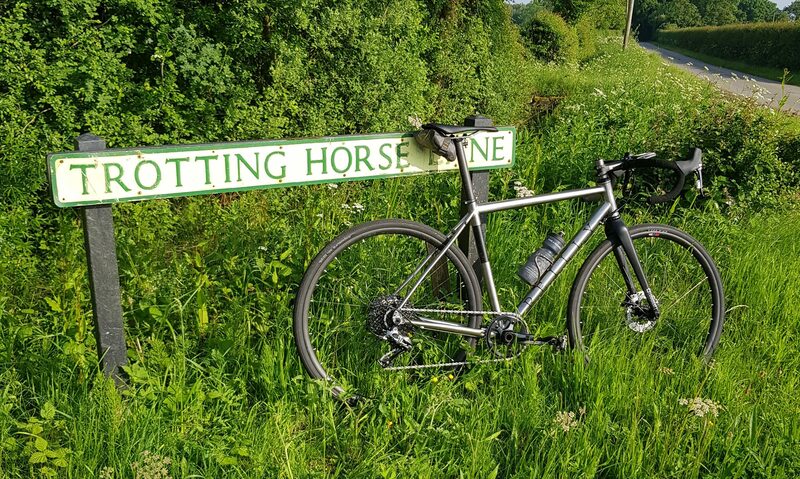 I span along on the Sunday morning club ride, rattled along local bridleways, terrorised the local MTB trail centre and loaded it up for a weekend of bikepacking. Not once did I feel I was on the wrong bike. That’s quite an achievement. Firstly, I took the Gradient out for some road riding. 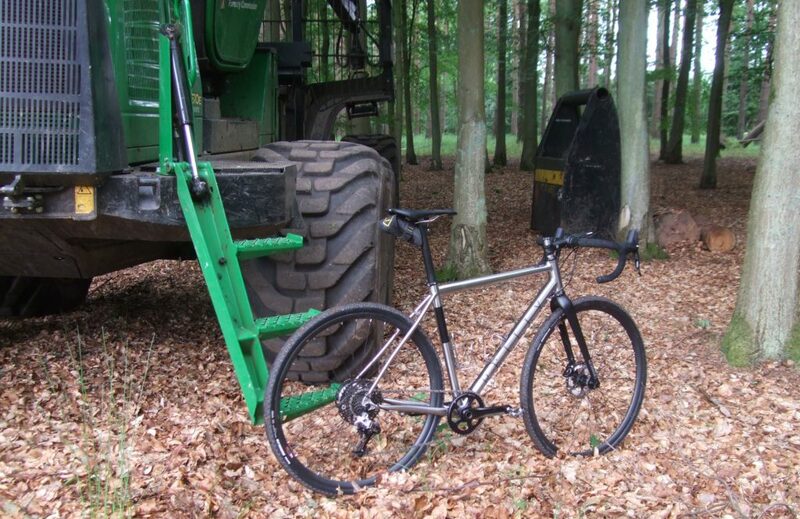 The (stock) Panaracer 35c Gravel King SK tyres made way for WTB’s 32c Exposure. These tyres have a slick central section with a file tread on the sides. They roll pretty well on tarmac. As long as the trails are bone dry, they are tough enough, and have just about adequate grip to take you offroad too. In ‘road mode’ the Reilly behaved every bit as well as any, disc equipped, endurance road bike. I was quite comfortable ticking over at 18s or 19s without much effort. Earlier in the day, I had been playing with a very blingy carbon road bike. The Reilly didn’t really feel any slower. 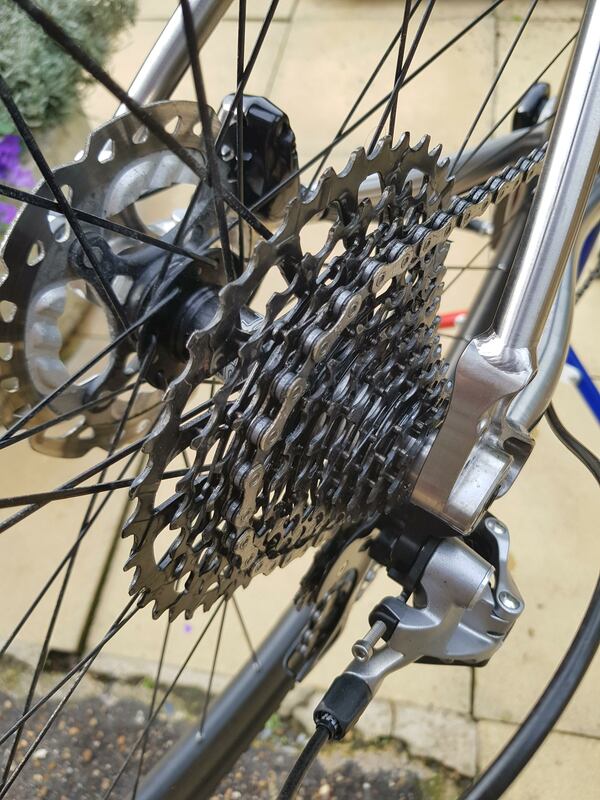 If anything, having the reassurance of disc brakes, I carried a lot more speed through the corners than on the 13lbs superbike. Swapping the tyres again. This time for the Maxxis’ 40c Rambler, a lightly treaded design with better off road capability. I headed off to the local bridleway network to see how the Reilly Gradient coped with the rough stuff. 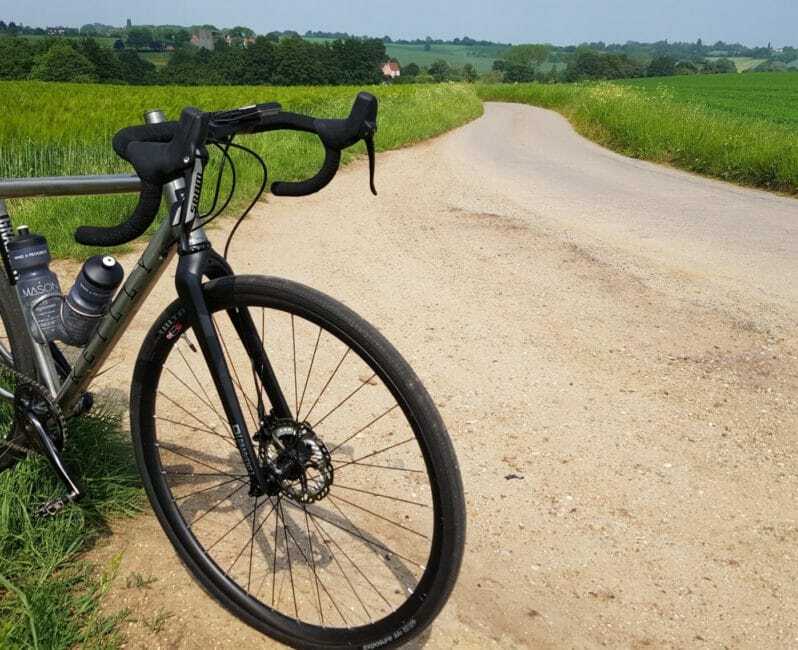 The Gradient is a road bike with huge tyre clearance. It simply refuses to let anything to slow it down. The more grunt you give it, the faster you go. Even off road, none of your power seems to be wasted. Having looked askance at the 31.6 seatpost, I expected the offroad ride to be somewhere between harsh and horrible. Well, this is where the combination of a well designed frame and titanium come into their own. The ride was much smoother than you might expect. This is why a good, titanium frame is such a desirable item. Reilly Gradient, somewhere in Thetford Forest. Unconsciously, I was being drawn towards Thetford Forest and its mountain bike trails. A Welsh trail centre, it is not, but fast and sweeping forest singletrack makes Thetford a hot spot for XC whippets. 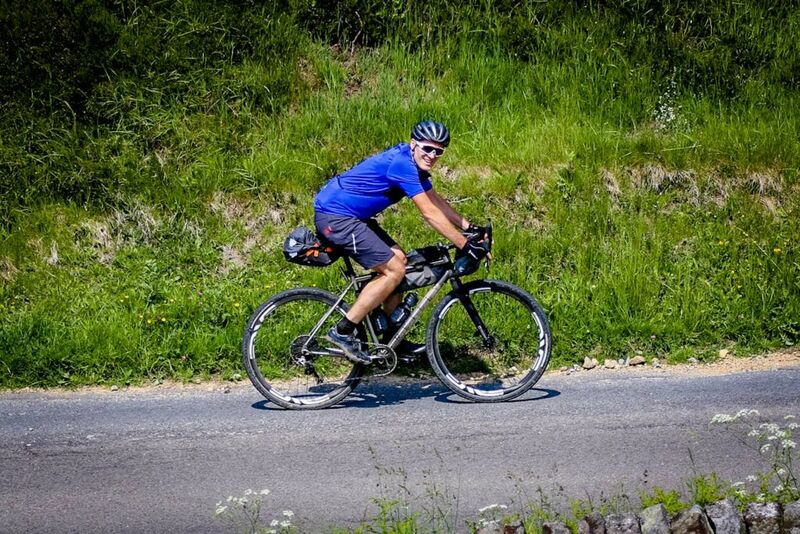 At ADVNTR, we have discovered it is also a real blast for a bike like the Gradient. Carving through tight and twisting corners, there is no obvious twitchiness, no matter how fast you are travelling. Your speed will be dictated by your courage and the amount of grip you can coax out of the tyres. How hard can you go? My final test with the Reilly Gradient was a weekend away in the Peak District. 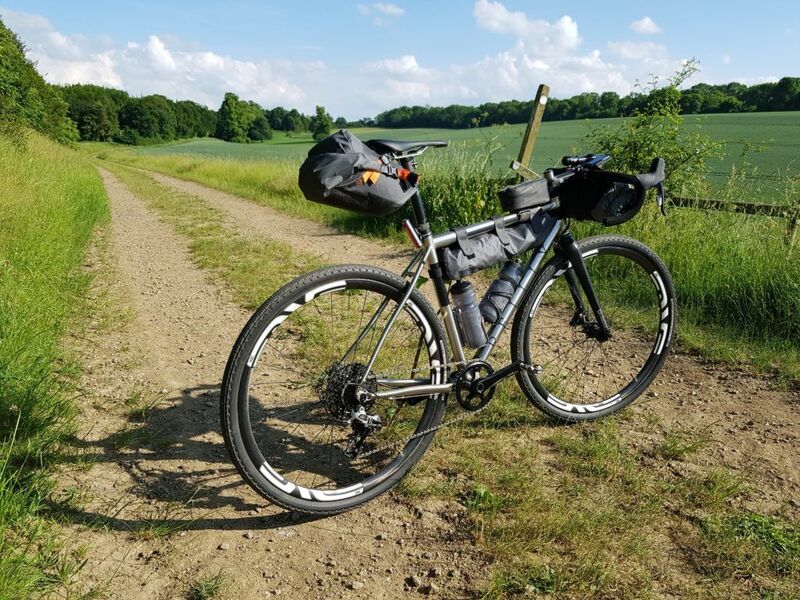 I went bikepacking at Focal Events’ ‘The Distance’. Race mode was replaced by a full load of camping gear and bags. 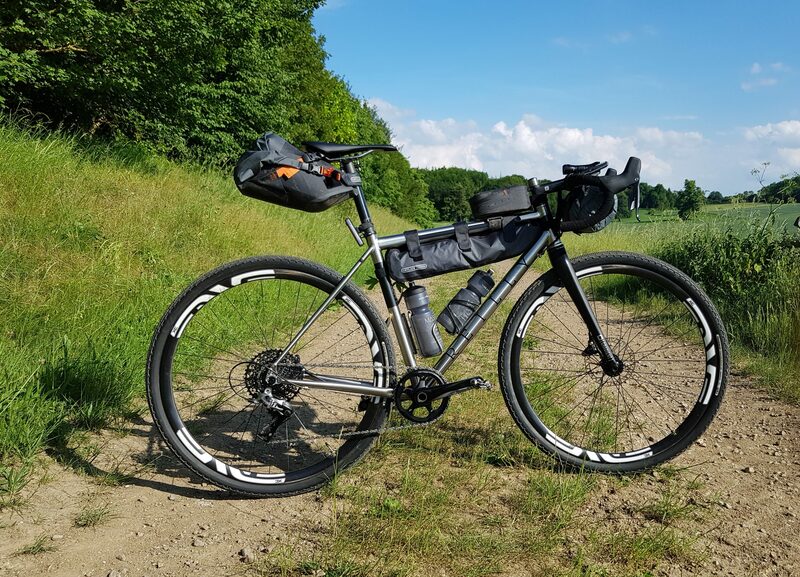 The Reilly still managed to look fast and wouldn’t have been out of place on the grand depart of the Transcontinental Race rather than a leisurely bikepacking jaunt. Loaded up and ready for a bikepacking mission. Loaded up, I expected the edge would be knocked off its speed. 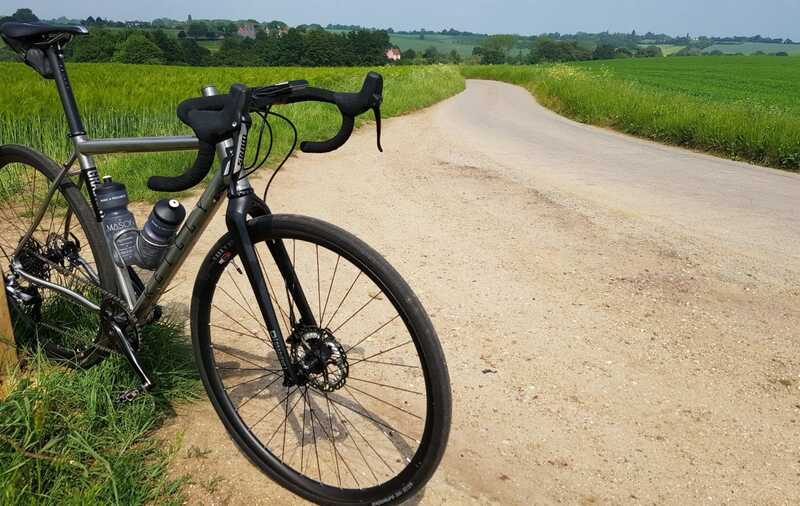 To compensate, I had swapped out the wheels (again) for a pair of racy ENVE carbon hoops and 43c Paneracer Gravel King SK rubber, still with plenty of clearance. My logic was that the lighter my bikepacking rig, the more fun the journey would be! Carbon wonder wheels aside, and packing a few extra pounds, the bike retained its ‘get up and go’. I was a little more cautious than normal on steep descents. The rear saddle pack seemed determined to throw me over the bars. Luckily, I learned to compensate for the additional weight and unexpected momentum, and showed it who was boss. For the bikepacking curious, that’s Ortlieb’s medium Seat Pack, Frame Pack and Top Tube Pack. 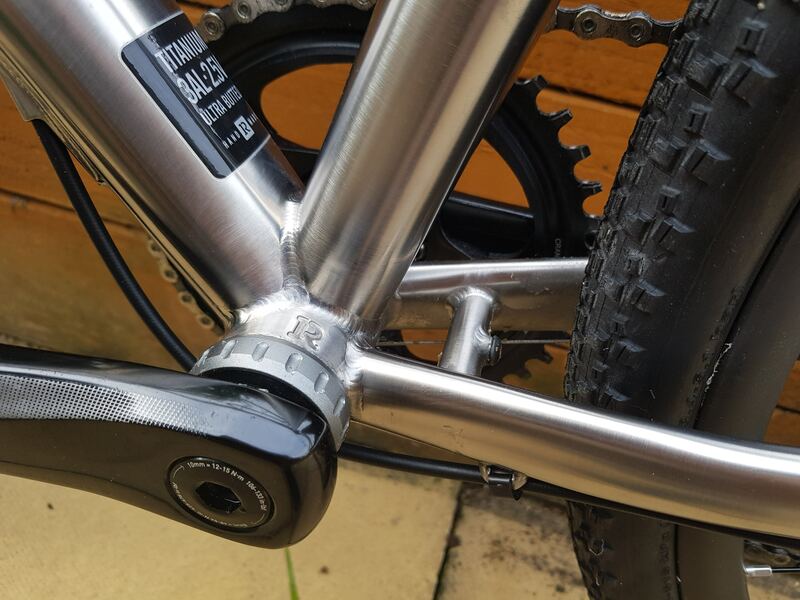 Perhaps the nicest thing about a titanium frame is that you don’t have to worry about bags rubbing the paint off. It will simply develop a careworn patina yet still comes up perfect after you’ve washed away the grime of your adventures. Bad points? Not many. 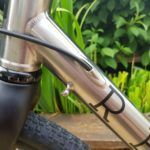 The fork axle did appear to slacken off ever so slightly after rocky descents, not by much but enough to create wheel wobble. 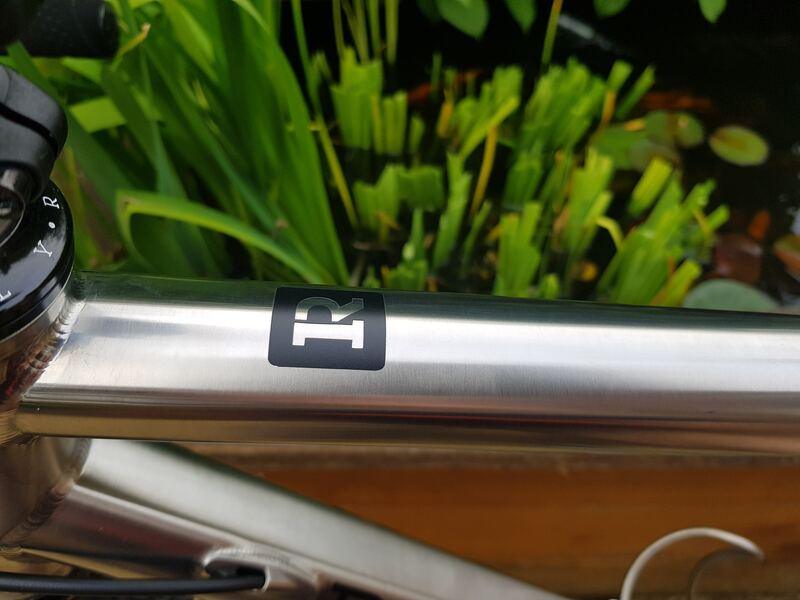 Secondly, the decals have started to peel on the fork. Decals are also applied to the frame rather than beadblasted, brushed mirror logos can be requested at extra cost. I could tell the Gradient was going to be a fun bike to ride as soon as I saw it. And I was right. 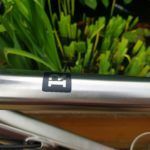 The frame has a quality finish, and you have the option to fit racks and mudguards (which we didn’t test). The frame is clearly capable of doing everything with aplomb and feels every bit the road bike with fat tyres. It’s a fast bike and a rapid climber. The steep head angle does make it a nervous descender on technical terrain compared to some other bikes we have ridden. The Mason Bokeh remains the most confident descender we’ve ridden. It isn’t cheap, but compare it to the Mason Bokeh Ti and it starts to look more affordable. The lifetime warranty gives you the reassurance that you’ll have a ‘friend for life’ too. Plus there is the promise that you can scale back the bike collection thanks to the Gradient’s all round versatility and win points with the significant other. Buy it complete, or buy the frame and assemble your dream bike, it is up to you. Rest assured, whatever you do , you will not be disappointed.